Hello Tinplate world ... Standard Gauge (as the world knows it) began with Josh Lionel introducing his new 3rd rail line of electric toy trains ...first examples ( trolleys #2 & #1) to roll off the production line ( probably a few 8" work benches) in November 1906 ( don't believe all the stuff you've read before ) . Of course the standard had no standard ... but repeat the lie long enough and you create a new standard. Standard being a standard everything had to run on the standard ... 42" diameter... yes it looks funny on anything bigger than a #33 ...but it's the standard. Enter Ives, Flyer, Dorfan everyone designs for the "standard"..... Boucher did their own thing with diameter's up to 80" ..but they had a very very small market ... so don't go there. By the mid 20's the kids that grew up with 1st generation electric trains wanted more ... but the little loop on the floor just did not cut it anymore ... and the soup cans on wheels had lost their charm .... enter the age of realism .."scale modeling" . Paul Egolf headed the charge on 1/4 " scale O gauge , 1/2" was the domain for live steam ... 1 gauge had pretty much vanished this side the the pond ...but it scaled to 3/8" + - ... and "standard gauge" had no standards in the scale world .... a few choose 3/8" and a few went with 7/16ths .... Paul Egolf bumped his diameters out to 72" ..( yes the original 072 only 10 years before the market leader Lionel ) ...but for real scale the boys laughed at anything less then 96" for 1/4". Standard gauge ..in scale ... now you are up to the 10' + to come close to anything approaching reality .....and that was the breaking point for the big gauges ... death of standard gauge was swift, big man on campus in the 1930-32 range was swept aside by 1934 with O gauge ...which in turn was struggling for second by a the rapid up start of HO by WW2 . 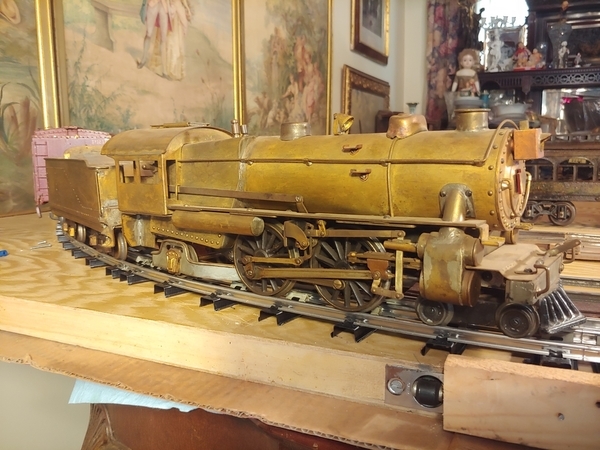 Standard gauge modeler Jack Schaaf began as a kit basher of Ives trains .. but up his skills by 1934 with his brass E6 ..followed by his finest, a Pacific . ... Jack modified Ives transitional Flyer cars .. which are relatively close to 3/8" scale if you extend them ... Jack ran on Gilpatrick's RR in CT... articles found on Popular Science January 1935 ( same issue has Bill Walther's article about his full scale M10,000 ( yes it came out the same time as Lionel's ) 1 /4" ..his first entry into O scale ...leaving his standard gauge layout behind). Here you have Jack Schaaf's E6 . roughly 3/8" ...pulling a string of Lobaugh freights 7 /16ths ...around a 87" loop ... it's tight ! That’s great, incredible detail on the E6. Carey, great information and much to learn of the evolution of the hobby. Questions: what track is the E6 running on? Who manufactured it? The Lobaugh came with a center rail pickup? It's easy to built standard gauge "flex track" using traditional rails and ties. Chris Bogus and I installed curves up to 132" diameter on our Horseshoe Curve SGMA modules. Contact me at standardgaugetrack@gmail.com for more information. Standard gauge scale? DOUBLE oxymoran! Neither the track nor the engines and cars were ever "standard", and MUCH less to any scale! Old Josh was just a supreme marketing genius! LOL! Seriously, I suppose one could extrapolate a "scale" for this originally not-so-standard gauge, but it would be just that. Joshua Cowen apparently knew if you repeated an untruthful claim loud and long enough, it might just become the norm, which much to his delight, actually did! Lionel "Standard" gauge, at its inception, was the ODD gauge, compared to the existing Marklin numerical gauges of the day! In a next version I will include some of the things I learned here from Carey on scale for Standard Gauge. Hello all ..in the mid 30's there was such a stigma about the term "standard gauge" .....that NMRA and some modelers thought it would be best to call "standard gauge" 2" gauge ...yes even if it does measure 2 1/4" ......very confused folks ..G Vaughn one of the prominent "standard " gauge builders .... his pieces are referred to both as 2" and standard ... (remember a committee like the NMRA could not even figure out the correct scale for O gauge 1/4" ok even if 17/64ths is correct ) . Here you have two of Vaughn's pieces ..one standard ..one 2" .....both run on the same track ... both are standard gauge ....and modeled to 3/8" scale . Not to " rain on anybody's parade"either. Dorfan, Ives, and Lionel all promoted their trains as "Toys for Boys". Imagination and creativity were the tools kids used to make their railroad empire real. The "scale" to a child meant nothing. If a dump truck looked good , had a play purpose, it was incorporated. Lead soldiers and other figures that were all that was available at the time, made play more realistic. No one was concerned with "scale". Hard rubber toys, diecast cars, lead figures, oversized cross bucks, litho buildings with no opening doors or windows all were part of the play...none of it to " scale". The size of a 42" oval of track and the "size" of a bed room or living room floor, as well as " moms" disposition toward a reasonable amount of toys being strewn about the house, all came into play limiting what could be displayed and played with the train set. The vendor catalogues gave subtle psycological suggestions by way of images of kids playing with the train and limited accessories, as to what a desireable " layout" should be. "Scale" is something that I personally believe resulted from a european perspective and influence. Probably more promoted by firms like Marklin and Bing ,and others. Either way tinplate is fun for kids of all ages " even us BIG kids, "scale" or not. 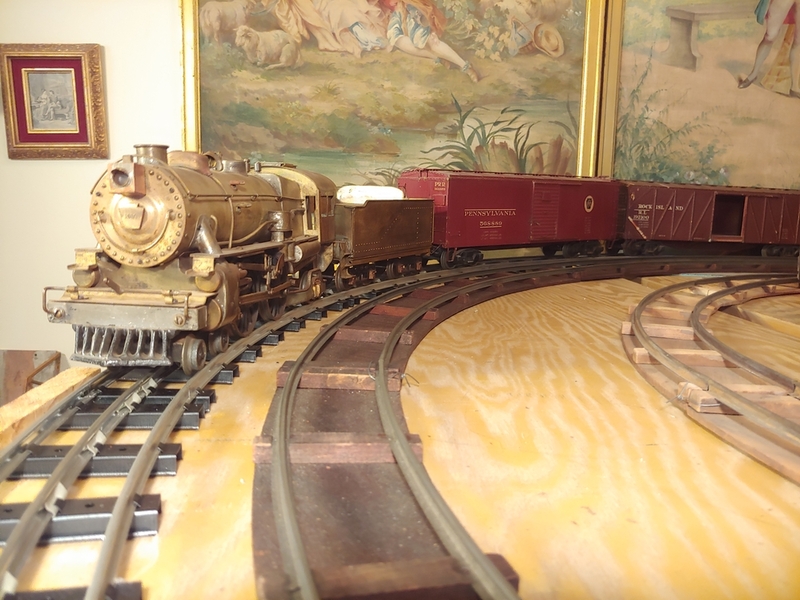 Again, there is a dichotomy, though admittedly less pronounced during the golden years of tinplate, between the scale modeler and the toy train enthusiasts, which still exists today to a greater degree. There will always be different approaches, and none being more valid than any other, because as I said earlier, it is a big tent, and there is room for all! CHEERS! Hello all ...scale or tinplate is a personal choice ....but the mass market moved away from classic "tinplate " in the 30's. 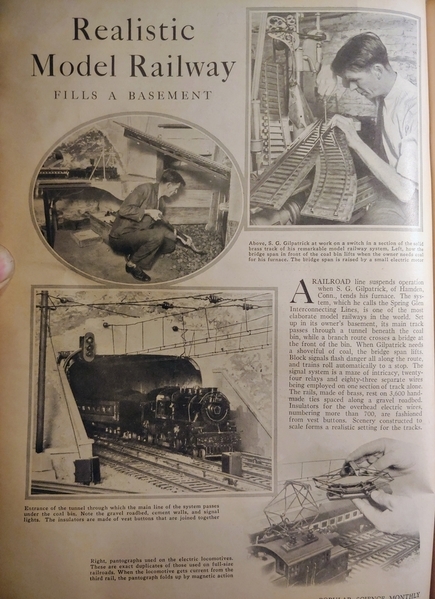 Grass roots of the scale movement can be traced to Modelmaker magazine beginning in 1924 giving a voice to follow modelers who wanted more realistic trains. Ives 1134 die-cast steamer in 1928 is a much more "realistic looking engine compared to other "toy train manufactures offerings ...and it's sale to AF in 1929 helped push their steamer line to more realistic appearances than Lionel's. Lionel with it's introduction of their "Lionel Magazine " ....and marketing push to "sell" model railroading as a father & son learning / binding activity encouraged train modifications of the Lionel product to create a RR empire . The shift to push the "toy train " from a annual loop around the tree to a year long "hobby" was to stimulate train sales through out the calendar . The Century of Progress 1933-4 did more to advance the scale world than any other single factor ..and is cited as such in numerous testimonials by former "tinplaters" now scale modelers in many of the periodicals late 30's and 40's . The Century of Progress with is numerous large O scale layouts with realistic rolling stock and wide curves was contrasted by American Flyer's standard gauge layout where visitors raced the trains around the layout at a push of a button . 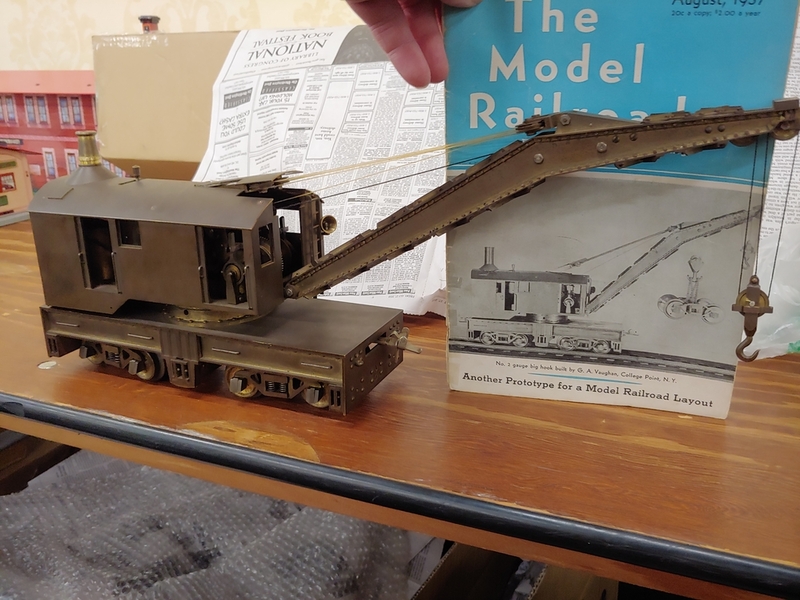 1933 Model Craftsman is begun, 1934 Model Railroading begins , concurrently standard gauge sales drop and Lionel scrambles to retool for a more realistic looking models ...releasing the M10,000 November 1934 in it first step to bring a more realistic look to it's product line. 1935 HO gets a foot hold on the model train market with 2 rail operation. 1939 two rail operation is common among O scale replacing outside 3rd rail. 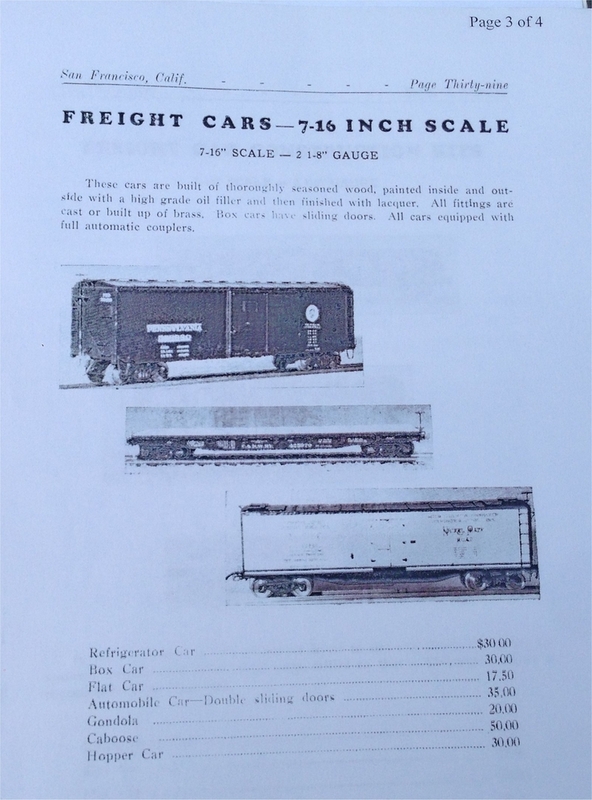 1941 in the Model Railroader pole HO surpasses O gauge as the preferred gauge due to space and cost requirements . Tinplate has it's many charms but the market winds changed in the 30's and all the toy manufactures had to change with it to keep up with the public's evolving taste. Not picking any fights, or scale is better than tinplate ...just calling the runners in the horse race as they round the track. I swing both ways ..tinplate and scale ... each have an interesting history . Carey: The late, great Hal Carstens published a wonderful and instructive book entitled "150 Years of Train Models" about two decades ago, in which he traced the origin of all train models and the evolution from tinplate toy trains to scale model trains, with an emphasis on the early pioneer manufacturers, hobby and trade organizations, and publishers of key periodicals that supported those early modeling efforts, including his own excellent Railroad Model Craftsman. Quite an informative read, with lots of photos. Highly recommended, and, heretofore, my main schooling in the important transitions in our great hobby. Worth a look! CHEERS!